Kim Robinson was diagnosed with breast cancer in June 2017 and she found out she had the disease in not one, but both breasts. Kim was looking at needing a mastectomy but after a few biopsies, her doctor told her that the lumps could be removed through surgery. Luckily, Kim’s cancer hadn’t spread to her lymph nodes, but after her surgery to remove the lumps she had to have radiotherapy to make sure the cancer didn’t spread anywhere else. Since her surgery Kim has wanted to fundraise for the Breast Cancer Care Unit at Good Hope Hospital to thank the staff for all of their help and care during the time she spent at the hospital receiving her treatment. 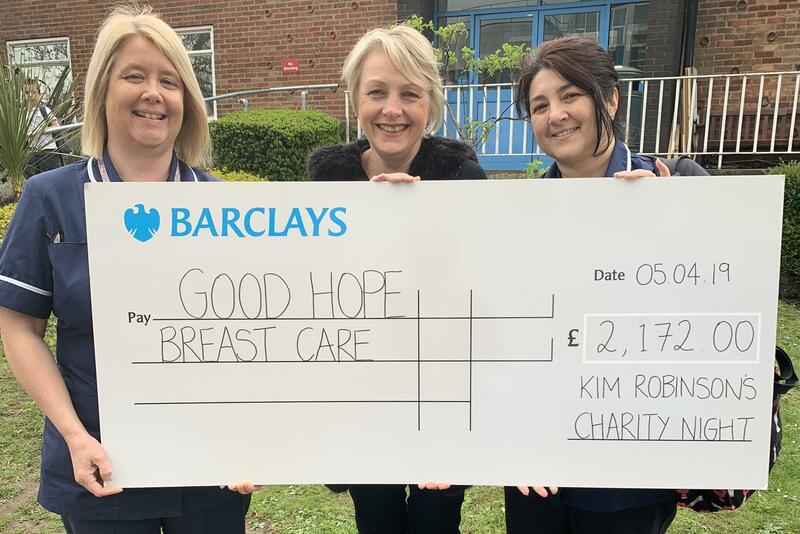 Kim said: “I know a lot of people do not have a good outcome or have it as easy as I felt I had it, but the support I had was excellent so I decided I wanted to thank the Good Hope Breast Care Unit by raising some money for them. This year, Kim organised a 1970s/80s style charity night with a tribute band and fancy dress and raised an incredible £2,172 from her very special night! This hasn’t been the start of Kim’s fundraising; ten years ago she took part in three separate events to raise money as her sister sadly passed away at the age of 18 after being diagnosed with cancer of the muscle tissue at 12, and bone cancer at the age of 17. Laura Power, Fundraising Manager at Good Hope Hospital Charity, said: "A huge thank you to Kim for organising such an amazing night that raised an incredible amount of money for Breast Cancer care at Good Hope Hospital. "The money will go towards added extras for patients just like Kim to make sure that they all have all of the help and support that they need whilst being treated at the hospital." If Kim’s story has inspired you, you can create an event like hers yourself, or take part in one of our events, you can find out more about them here. To find out more information about the Cancer Unit at Good Hope Hospital and how you can get involved with fundraising, please read more here or contact Laura.Power@uhb.nhs.uk.